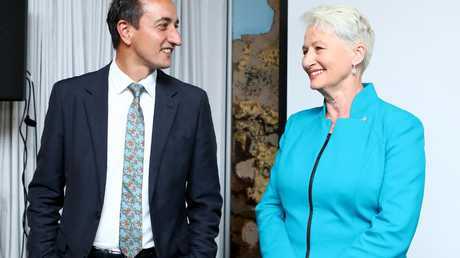 Dave Sharma and Kerryn Phelps. SHOCK internal Liberal Party polling has shown the government could lose Saturday's Wentworth by-election to independent candidate Kerryn Phelps. 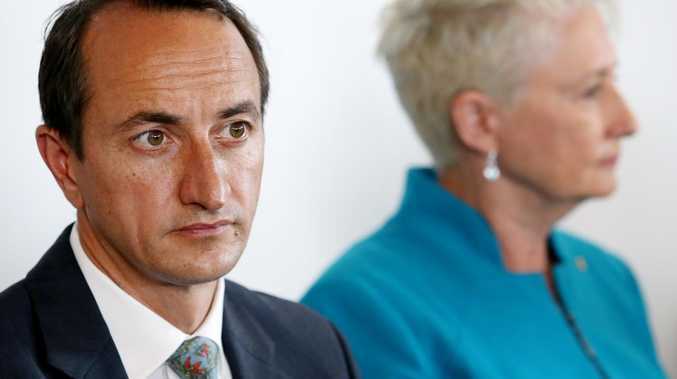 The Australian reports the latest batch of polling conducted for the Liberals shows Dr Phelps ahead of Dave Sharma 55-45 on the two party preferred measure. A week ago they were locked at 50-50. Former prime minister Malcolm Turnbull, who quit as Wentworth's MP after he was ejected from the top job, held the seat with a two-party majority of almost 18 per cent. Scott Morrison's government currently holds a one-seat majority in parliament. Defeat in the by-election would force it to rely on the crossbenchers to govern before the next federal election, which must be held by May. The Liberals fear they will be hurt by Wentworth's voters assuming they will hold the seat. It is possible today's polling was leaked in an attempt to get more Coalition voters to show up at the polls. Yesterday Mr Morrison was accused of jeopardising Australia's foreign policy in a play for more support in Wentworth. The Prime Minister announced he would consider moving our embassy in Israel from Tel Aviv to Jerusalem and recognising the holy city as its capital. The ownership of Jerusalem is a deeply controversial issue. Both the Israelis and Palestinians claim it as their own, and its final status has long been one of the major obstacles in negotiations for a two-state solution. There were fears yesterday that Mr Morrison's move risked alienating Indonesia, with whom Australia is supposed to sign a new free trade deal before the end of the year. His timing was interesting to say the least, with the by-election just days away. Wentworth happens to have a large proportion of Jewish voters. Mr Morrison credited Mr Sharma with raising the issue. Mr Sharma is a former ambassador to Israel. "When sensible suggestions are put forward that are consistent with your policy and in this case, pursuing a two-state solution, Australia should be open-minded to this and I am open-minded to this," Mr Morrison said. "I'm not going to close my mind off to things that can actually be done better and differently. "We are committed a two-state solution, but frankly, it hasn't been going that well. Not a lot of progress has been made. And you don't keep doing the same thing and expect different solutions." The Prime Minister said no decision had been made on the embassy yet, and he would consult his cabinet colleagues and other world leaders to gauge their opinions on the matter. Dr Phelps slammed the announcement as "politically timed", telling a forum at the NSW Jewish Board of Deputies last night it was made "without a proper analysis of the defence, trade and security implications". However she has not ruled out supporting such a move herself. Dr Phelps said she would ask for a security briefing to help her decide, should she win a place in parliament. Mr Sharma, for his part, told the forum Mr Morrison's announcement was provoked by a United Nations resolution which required Australia to declare its political intentions. Mr Morrison said he would not support a push for the Palestinian Authority to chair the G77, a coalition of developing nations at the UN. If Australia does move its embassy, it will be following the lead of US President Donald Trump, who did the same thing in May. Mr Trump's decision led to mass protests in Gaza, in which Israeli forces killed 58 Palestinians. Mr Sharma wrote an opinion piece at the time examining the issue in some depth. "It makes no sense to deny the centuries of history that link the Jewish people to Jerusalem," he wrote. "It also makes little sense to pretend the western part of Jerusalem is not sovereign Israeli territory. Israel's Knesset (parliament), Supreme Court, the official residences of its prime minister and president and many other state institutions lie within it. "Foreign dignitaries, including Malcolm Turnbull and Foreign Minister Julie Bishop (who were still in their jobs at the time), base themselves at west Jerusalem's King of David Hotel during official visits. As an ambassador, I would travel from Tel Aviv to Jerusalem several times a week to meet ministers and officials." However he also acknowledged America's move came with significant risks and would "inflame" opinion across the Middle East. Mr Sharma said the United States should "make clear that Trump's statement is not an endorsement of Israel's claim of sovereignty over the entire city of Jerusalem, and that it expects a Palestinian capital in the predominantly Arab neighbourhoods of east Jerusalem will emerge during final status negotiations."